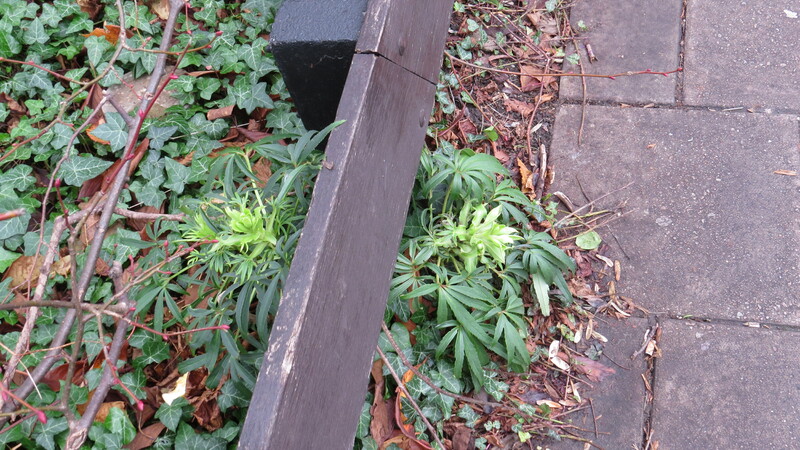 Dear Readers, last week I was surprised to find a specimen of Stinking Hellebore growing next to a bus stop on Fortis Green Road in East Finchley. What was this exotic-looking plant doing in such a prosaic environment? With its palmate leaves reaching out to tug at my ankles, and its pale green shoots, it looks like a small but friendly alien. It is unlikely that this is a truly ‘wild’ plant – most likely it is a garden escape – but it is also native to the south-east of England. Whatever its status, it is a very fine plant, and one with many interesting characteristics. 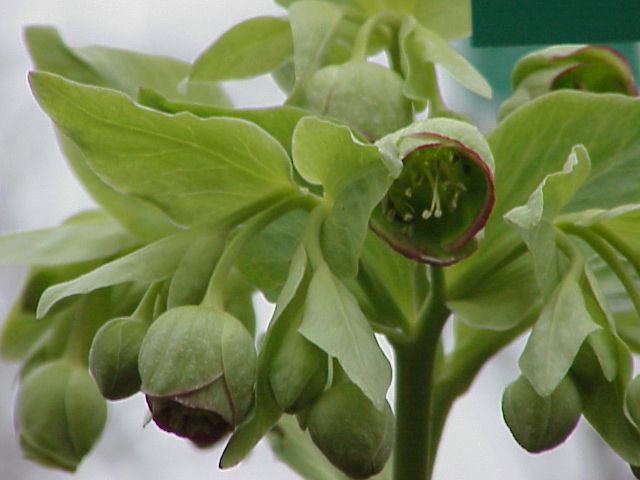 Stinking hellebore is a member of the buttercup family, which is more clearly seen when the plant is in bloom. The flowers contain up to ten nectaries, glands which produce nectar. Yeasts live in these nectaries, and raise the temperature of the plant, which enables the perfume which attracts insects to the blooms to be more easily diffused into the surrounding air. A hellebore containing a high density of these yeasts can be up to 7 degrees centigrade warmer than a plant with no yeast. 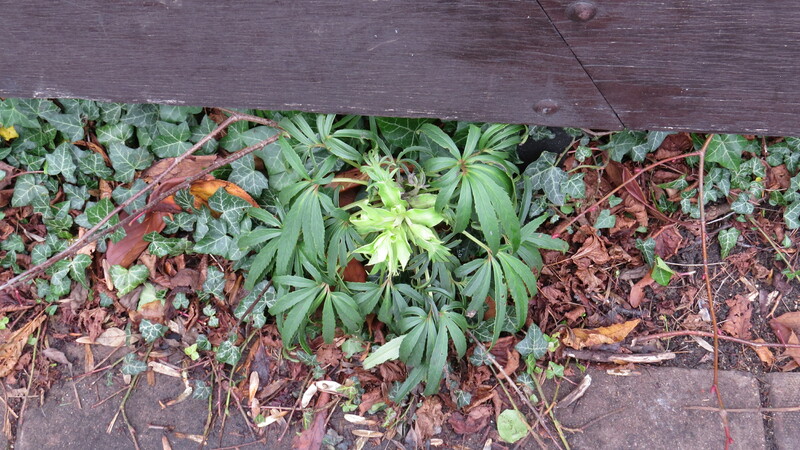 Stinking hellebore is the first plant where such a relationship has been observed – usually plants which increase their temperature, such as the Cuckoo Pint, use chemical reactions within the plant itself. As the plant is a very early bloomer (some have recently been spotted in flower already in the south of England) it is a very welcome source of sustenance for all manner of early-flying pollinators, and maybe the temperature difference between it and the surrounding frigid air acts as a kind of homing beacon. You might expect that the flowers of this plant would smell unpleasant, but in fact the plant is named for the smell of its crushed foliage, which is variously described as ‘pungent’ ‘unpleasantly mousy’, and ‘beefy’. It has a fine array of names alluding to its unfortunate perfume, including Dungwort and Stinkwort. However, it also has the rather obscure name of Setterwort. 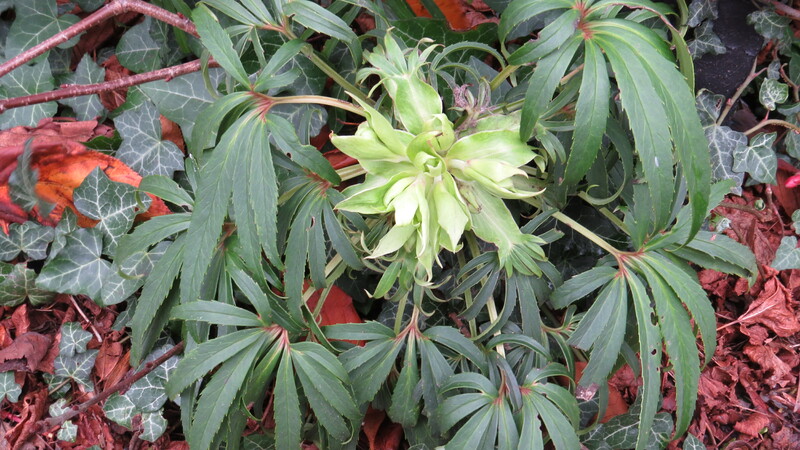 This appears to refer to the practice of ‘Settering’ which was used when cattle had boils or abscesses, and a thread made from the root of stinking hellebore was drawn through the infected area to draw out the pus. Maybe the chemicals in the root acted as a kind of antibiotic? “Where it killed not the patient, it would certainly kill the worms; but the worst of it is, it will sometimes kill both“. It was especially dangerous when ingested by children. If lucky, the worms would be expelled from the child, but if the poison only resulted in the parasites retreating to the child’s stomach, a second dose might be administered, with fatal results. In the ever-fascinating Poison Garden website, John Robertson describes how hellebores contain a substance called protoanemonin, which can cause skin problems. One incident involved someone who placed some nearly ripe hellebore seedpods in their back pocket and then drove for two hours to get home. The unfortunate person had serious blisters as a result of juice from the plant seeping through two layers of clothing. Clearly, this is a plant that needs to be handled with care. 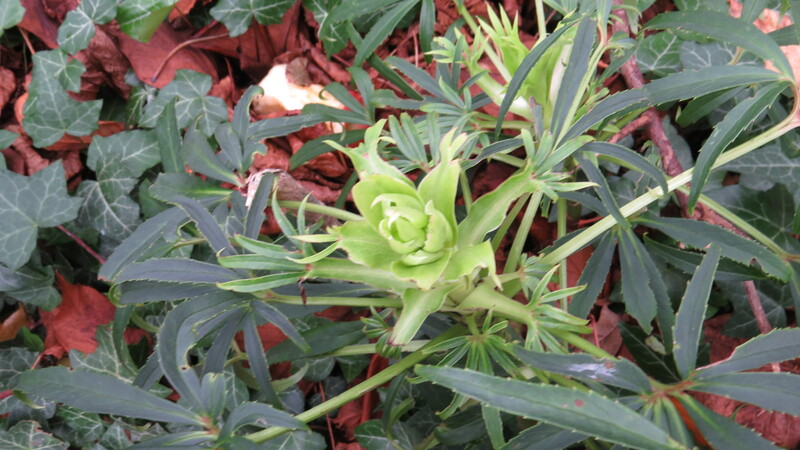 John Robertson also describes how digging up a hellebore can be dangerous for your health. According to Pliny, if an eagle spots you engaged in such a task, the bird will cause your death, unless you draw a circle around the plant, face East and offer up a prayer before continuing with your spadework. One can only speculate as to how such legends grow up, but, having never seen anything bigger than a buzzard in the skies over East Finchley, I imagine that any hellebore transplanters will be relatively safe, though you might want to offer up a prayer just in case. As one of the ‘baneful plants’ of witchcraft, Stinking hellebore is a plant that should be taken seriously – it is even said that Alexander the Great died from hellebore poisoning. However, it also has mystical associations, and is sometimes included as one of the ingredients of the ‘Flying Ointment’ that enabled witches to fly. It is also said to confer invisibility. And there can be no doubt whatsoever that to a hungry, cold queen bumblebee, emerging from hibernation on an unnaturally mild winter day, its nectar can be a life-saver. 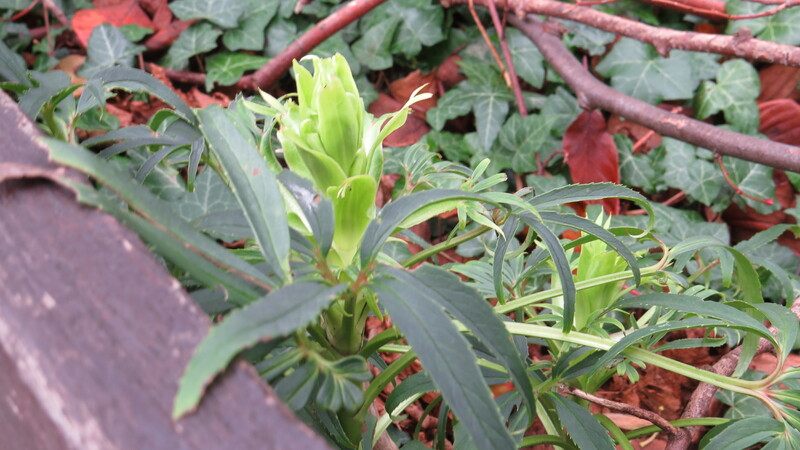 In my cold, shady, north-facing garden I think a few thickets of Stinking hellebore might be just the ticket to give some winter wildlife interest. I will let you know how I get on! This entry was posted in London Plants on December 9, 2015 by Bug Woman. Confers invisibility … now you’re talking. Please investigate.